10 Good reasons why we all deserve a whippet dog in our lives. The intensity of whippets in the hunt or race will definitely teach you something about living your passions to the fullest. A whippet's intense relationship with the couch will no doubt teach you also something about relaxation. These dogs love to be close to you. There are few things as unwinding and fulfilling (except maybe holding a newborn) as sharing your sofa with your whippet for a well deserved nap. You will never again have to feel lonely when you go to the bathroom. Whippets tend to follow you from room to room. My husband says that I walk around the house with my armed guards. Actually I bet my dogs think I am their armed guard or maybe they are just worried that I might vanish into thin air before feeding them dinner. Your mailman will be grateful to you for having a whippet. Whippets are well known to be good alarm dogs but they are soon convinced of people’s good intentions. It’s comforting to know that the mailman, the cleaning lady, your children and their friends won’t be considered chewing toys by your dog. Dogs have a wonderful sense of timing and like steady daily routines. There is nothing like your whippet doe eyes to make you get up from your computer for a good walk or a jog. A whippet will become your best personal trainer. As we could appreciate in our travels these wonderful little dogs are very adaptable to any of the circumstances they might find themselves in. In the country they’ll enjoy the great outdoors with abandon. In town they will be contented with a daily walk in the park and will sit at your feet in a restaurant or cafe, as long as you provide a comfy blanket to lie on. 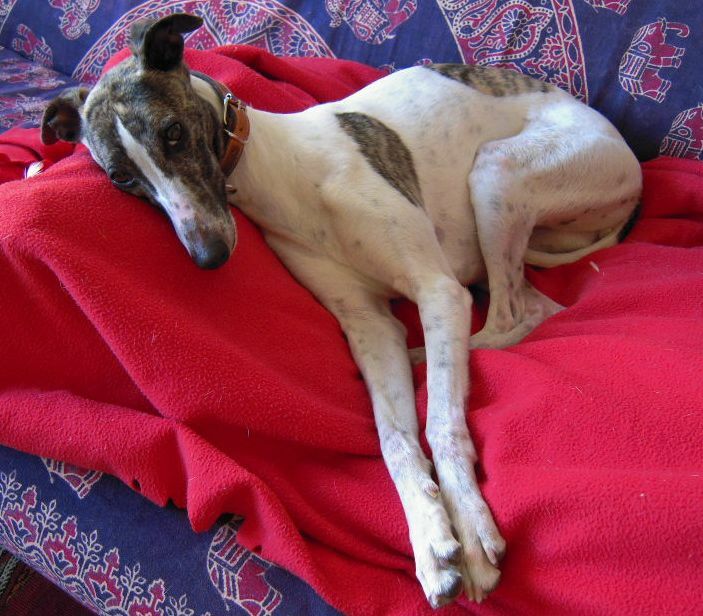 A whippet dog will happily play with the kids or keep them company for a nap on the sofa. Whippets are medium size dogs. You don’t need a huge car or an enormous crate to fit your dog in. Most hotels will refuse squarely to host large size dogs but are more accommodating towards medium and small dogs. Feeding a large dog can be very expensive. Also, in most cities you are supposed to clean after your dog and unfortunately the size of the waste is proportionate to the size of the dog and the amount of food digested. A dog of this size is easy to handle for a child (who could be too clumsy or boisterous for a tiny dog) or an elder person who might not be strong enough to handle a large dog at the park or during a vet visit. Often medium size dog breeds have larger voices than what it might be expected and offer a good deterrent for intruders. In some countries there are restrictive laws for keeping large dogs that don’t apply to a medium size dog. For the joy of fastidious housekeepers whippets bring very little dirt in the house. They are really low maintenance dogs, shed minimally and are virtually odorless. Whippets bark only when is necessary and their voice is that of a bigger dog, a good deterrent for intruders. Do you need more reasons to have a whippet dog in your life? I know there are lots of other good reasons to let a whippet dog in your life. Read below some of the contributions and then, if you have a favorite one and you want to share it, drop us a line. We’ll be happy to publish your view of what makes a whippet such a good companion. Pictures are very welcome and your whippet may be featured on our homepage as "Dog of the Day"! Why Do You Need a Whippet Dog? Do you have a great story about your whippet dog? Share it! I love whippets because I don't like hoovering! I wonder if whippet coat hair drops at any time. Even if you tug it, it won't come off! Why do you need a whippet? : Because a whippet won't let you get away with being a couch potato for very long! Because they are beautiful, elegant and adorable dogs, and I wouldn't be without my four whippets and one greyhound! JUST GOT A WHIPPET , CANT WAIT 4 OUR LIFETIME COMPANIONSHIP!